Do the food and lifestyle products we spend the money that God has entrusted on matter? In episode 006 of the Simply to Thrive podcast, we chat about it – looking at what and how much money America overall spends on food, healthcare, etc. and if we should care as the Body of Christ with what we support. » Money is a powerful resource, and the question becomes, what is the Church spending God’s money on? If it’s not being spent to support flourishing and building His Kingdom, then something is wrong. » We have an opportunity to use this resource of money that God has entrusted to us to support life and flourishing, and be about what God is about, and support thriving in terms of our health, others, and the environment, and be good stewards of His creation simply by what we purchase. » Let’s imagine if the Church didn’t reflect the culture in this way… I think the physical health of the Church would be drastically different… we would have more of this resource to put toward furthering the Kingdom. Is the money that you spend on food, products, etc. honoring and glorifying God? Do I spend the money that God has entrusted to me on food and products that support life and flourishing? Before making a purchase, here is a question you can ask yourself… am I stewarding the money God has entrusted to me well by making this purchase? Cardiovascular Disease (CVDs) Fact Sheet. World Health Organization. Houston M, Minich D, Sinatra ST, Kahn JK, Guarneri M. Recent Science and Clinical Application of Nutrition to Coronary Heart Disease. J Am Coll Nutr. 2017. Thank you for being a part of these conversations. I appreciate you and would love to hear how this podcast encouraged you, impacted you, or what stood out to you. Message me on Instagram or Facebook, or email me at [email protected] to share with me. Send me any nutrition/wellness/lifestyle related question you have that you’d like me to address on the podcast.Also, please hop on over to your podcast platform (find linked just below), give the podcast a 5-star rating and share with others how you are enjoying the conversations. 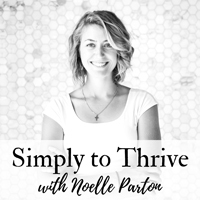 It would mean so much to me and will also help others just like you who are wanting to connect nutrition and wellness to their faith to find the Simply to Thrive podcast. You can also do that by sharing this episode with someone you know who would be interested in joining the community.